Sino-Pack 2014, the 21st China international Exhibition on Packaging Machinery & Materials and China (Guangzhou) International Packaging Products Gala, namely as Pack Inno 2014 will be held from March 3-5, 2014 at China Import & Export Fair Complex, Guangzhou. The exhibition is composed of General Packaging Machinery Hall, Liquid Packaging Machinery Hall, Packaging Products & Materials Hall, and Automation/International Hall, with categorized packaging applications for food, beverage, daily chemical and pharmaceutical industries. 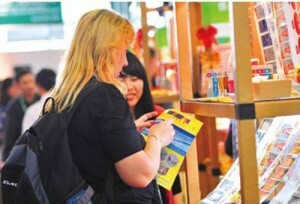 Sino-Pack 2014 gathers 500 renowned exhibitors. For instance, the leading manufacturers of industrial robots – KUKA Robotics, FANUC, ABB, Delta, etc; the top global coding providers: Markem – Imaje, Videojet, Domino, Hitachi; And other renowned packaging equipment suppliers such as Omori, Youngsun, Hualian, Ishida, Mettler-Toledo, YIZUIMI, Arburg, Huangyan Plastic, Bestcrown, E-Shrink, Zhejiang Zhongcheng, Qingdao Songben, YuanAn, Schmalz, Bosa, Packmate, Xutain, Ruijijinhong , Yuanxu,Ding Ye, Alpha-Pack, ShengBaiWei, Gantan, Igus and much more. Visitor will find more insights from overseas pavilions either introduced by Packaging Machinery Manufacturers Institute (PMMI) from the US, Processing and Packaging Machinery Association (PPMA) from the UK, and Chinese Taipei Packaging Association (CTPA). The organizer, Adsale Exhibition Services Ltd, has rolled out a worldwide promotion campaign tailor for the invitation of decision makers and top trade buyers from food, beverage, daily chemical, pharmaceutical, wine, electronics, plastics industries to the exhibition, as well as overseas delegations from India, Indonesia, Malaysia, Philippines & Vietnam, etc. The theme hall Pack Inno 2014 is the unique platform demonstrating Chinese and international knowledge from Packaging Product and Materials, to Functional Packaging, Luxury Goods Packaging & Innovative Packaging, Packaging Design & Services. More than 200 exhibitors will bring along their quality packaging products for food, tea, cosmetics and wine in the concurrent Packaging Design Forum and Packaging Award Display Zone.